As mentioned a couple of weeks ago, Elder Son is now an apprentice bike mechanic. In Germany this is a two year course, mostly working in a bike shop with college one or two days a week. The college makes sure he has extra practical and theory lessons, and also theory, social studies, how and why the German government is built as it is, law and business studies: he’s not just being trained to be a bike wrench: he’s being trained to run a business. And yes I am envious, even more so because it turns out he’s pretty good at it. Take this week for example. As mentioned previously, we’d pulled most of the extra components off the bike frame ready for painting, but the cranks and bottom bracket (where the pedals go through the frame) needed some needed some tools I hadn’t got, so we arranged that Elder Son would ask his boss to lend us a couple. He was a bit unsure about this for fear of making a mistake (thanks schools system) but agreed to give it a go. He waved the crank remover, fitted it, turned the lever and removed the crank. I was instructed to rotate the bike. Next time I looked the other crank was neatly placed on the floor. Spanner was applied again, Bottom bracket removed. “Okay, so we can pack those up and sand the frame down.” He’d only taken the tools out of the bag three minutes earlier. This box represents an big step forward in the InGermany household. We’ve bought a new microwave. Our previous Microwave was given to us by some friends with a slightly apologetic comment of “My Granny was throwing it out: It’s a bit old.” and it was, in fact it was ancient, but we needed a microwave and we figured we could replace it later. That was about seventeen years ago. People have commented at times at the age of the microwave, but we’d always had other things to do and it still worked, after a fashion. It was noisy and the light packed up several years ago, but we got used to that. Then someone pointed out that the power consumption on the thing must be pretty high: I believe their actual words were “I can see the lights dimming whenever you cook something” so we started looking around for a replacement -until something came up, and then something else… you get the idea. Anyway, Beautiful wife got fed up and went online last month. 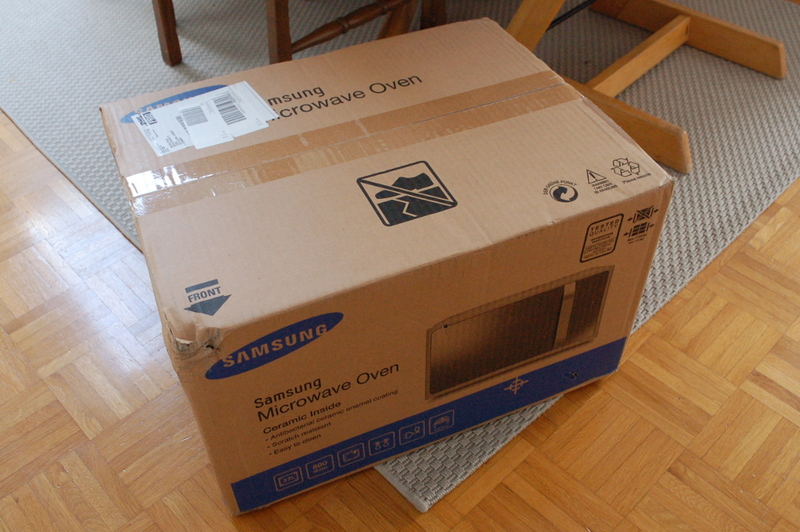 It took ten minutes to order a new one, and finally we have a microwave made in this century. Every now and again Beautiful Wife expresses the opinion that German food, while certainly filling, lacks a certain gastronomic variety, and that it’s time the boys experienced a little more of their maternal heritage. So last week we went of to visit the Asian supermarket in Stuttgart. The catch-all Asian supermarket, like the informative bus stop, is a fairly new development in Stuttgart. Despite being an engineering centre the city doesn’t have an east Asian community anything like as big as the cities to the north, and it’s only recently begun to have a cosmopolitan feel. Last time I bought some Marmite I even had to order it from Cologne. Possibly a bad example there. The supermarket is on the main shopping street in the centre but hidden inside a large sportswear shop, of all things. Once got past the piles of 2018 German football strips being sold off at reduced prices, we go down into the basement and landed in East Asia. Beautiful Wife went off in search of Green Tea ice cream and I went for a slightly nostalgic wander through shelves of “Healthy Boy Brand Chilly Sauce”, packed in what looks like glass lemonade bottles and source of some epic endurance contests amongst some colleagues in Thailand. There were also assorted items I was quite glad to leave behind in Japan like the unfortunately named ‘Calpis’ sports drink, sold in concentrate, with the English boast that “with 1.5l you can make 7.5l of Calpis”, which never failed to amuse our boys. Not far away is the dreaded Natou (“Na-chow”) sticky beans, made -let’s be honest here- by allowing beans to ferment, ie, rot, packaging the result up and selling it as a delicacy. But then being British means you can never be too cocky about other people’s tastes in food. As I was wandering about the cooking section which has the largest collection of woks I’ve ever seen, Beautiful Wife came around the corner waving a pot of Marmite. The theatre I work at is currently closed because it’s summer and nobody wants to sit in a stuffy theatre all evening when they could be out having a nice barbecue. The sound and lighting technician is away and to keep me out of trouble I’ve been given the job of making sure both stages are sanded down and repainted. This involves removing all 72 flip up seats from the tiny downstairs theatre & hauling them up the narrow stairs into the bar. As the seats are normal theatre flip up seats with stainless steel frames this job takes a considerable amount of time and foul language to accomplish. Then we realised we needed the fridges in the bar for an outside catering booking. So all the chairs needed to go into the basement, which due to the strange geography of the place is higher than the theatre (and universally known as “the chicken shed” but that’s another story). Then two days later we needed to use the basement for something else, so all the chairs had to be moved back to the bar. Of course this meant that the people who were supposed to be sanding and painting were in fact hauling chairs back and forth and swearing, so after a week the painting still isn’t finished and the theatre is an empty shell with ladders across the stage. Much excitement in Stuttgart this summer: the bus company has fitted real time information panels on their bus stops. I appreciate that other cities in the world have had these since before the turn of the century -I can remember them in Tokyo back in 2000- but for Stuttgart a lag of eighteen years in public transport technology is pretty good really. We live one kilometre outside of the city so I expect it’ll be a couple more decades before our local authority hears about them. Now that’s a great idea as far as it goes, but the information panels are tiny things to fit into the normal bus stop signs, so you can’t see them from a distance, for example as you get off the tram to catch the bus to work. On top of this, someone realised that when you have information panels you can put all kinds of useful messages onto them, so the actual bus times are sandwiched between lots of other helpful advice. Because of the peculiar geography of Stuttgart -the city founders, in their wisdom decided that a series of steep sided malaria ridden river valleys was the ideal place to make a city- the bus wiggles back and forth for a leisurely ten minutes down the hill, taking in several other parts of the city and crossing the path of every confused, lost, or otherwise distracted driver around. The pedestrian route from the tram stop to work takes 12 minutes, which means that unless the bus is about to come through the stop, it’s as quick to walk. Ever since we had the ‘Brexit’ vote, the UK government has been pretty cagey about what it means for us and the other 1.4 million Brits in the EU and 3.5 million EU Citizens in the UK. (although if this is the best they could come up with, perhaps that’s a good thing). This wasn’t quite as much of a worry for us in Germany as it was for EU citizens in the UK: we haven’t been attacked, told to “go home” or had anything shoved in our letterbox; our local immigration office was almost comically horrified when we asked if we may have to leave after 2019. One day last week the kitchen/restaurant had a had a a big catering contract, so very unusually the chef turned up at 0800, while I was having a quiet cuppa with the business manager (who deals with paperwork). The Chef saw the manager, grabbed an invoice that had just come with an early delivery, and wordlessly attempted to wrap it in a bow around the managers hand. This didn’t work so he proceeded to stuff it down the back of the managers shirt. As I mentioned last week, we had the big summer concert at work recently. Like lots of social organisations we occasionally do something like this, even though it means that for a couple of days we have to drop the treehuggy therapy side of our work and just put on a show. As an Arbeitserzieher/Occupational Therapist is essentially there to do the treehuggy therapy thing, this renders me pretty useless but fortunately there is still a need for someone to be a vaguely reliable gopher. Being generally useless was an advantage as the rain came pounding down at eight in the morning and kept going until early afternoon. I ended up being the designated Holder-up Of The Other Tent Pole so I managed to stay mostly dry, while all the people who knew what they were doing ended up getting soaked doing the complex techy stuff outside. The rain got bored and went home before the artists turned up, and when the audience arrived I was the Ironic Stage Door Bouncer and spent most of the evening persuading merry people that no, the entrance to the building is that way and there really isn’t anything interesting behind this door, and if they genuinely had an important message for someone I could take it to them et c. The rain held off until just before midnight when the band played its final encore: we have a strict 1200 finish, mainly because one of the largest police stations in Stuttgart is three doors down the road and the boys in blue apparently get really grumpy if their midnight doughnut round is disturbed. The tidying up part of the operation was simple enough even for an OT: It doesn’t matter where the cables are plugged in, you just tug at it until it comes loose and then dump the whole soggy mess onto our indoor stage to dry out by Monday. We were finished in two hours much to the disappointment of two very well lubricated festival goers who thought they’d finish off the evening listening to a band. After briefly considering turning into rowdily aggressive festival goers they decided that trying to annoy a dozen tired stage shifters was probably a bad idea and wandered off into the night. This week the theatre/social enterprise I work for was part of a big summer festival in our part of the city, which meant Saturday was full of loud music, crowds, lights, more loud music, and more crowds. Pretty much the standard town festival formula really. Oh, and it ran to midnight and after that we had to tidy everything up. And someone decided it would be a great idea to put the 5’3″ (168cm) Brit on the rota for the stage door bouncer. Still, there are worse ways to spend a Saturday night than trying to keep people on the public side of the stage door by sheer force of personality and a step. Besides, I got to hang out with some of our clients and hear their stories and as soon as enough time has passed that I can tell them without the people involved being identified you’ll read them here. Alas you won’t ever get the full experience of the Tale of the Announcers Dentures, to name but one, because that requires the announcer themselves to be recreating the situation and audiences reaction, but I’ll do my best. In the meantime, I’m going to stop writing before I lose the ability to use sentences and fall aslpffrrrrzzzzzzz….